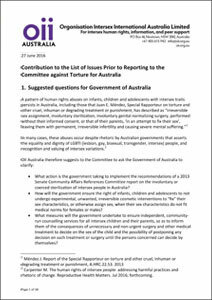 Committee against Torture investigates IGM in U.S. and Australia - STOP Intersex Genital Mutilations in Children's Clinics! YAY!! 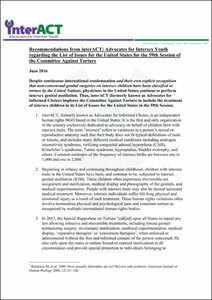 The UN-Committee against Torture (CAT) started an investigation of Intersex Genital Mutilations (IGM) in both the USA and Australia under Art. 16 of the Convention ("inhuman treatment" falling under the prohibition of torture). The Committee has formally asked the U.S. and Australia to provide statistics on IGM and to "indicate which criminal or civil remedies are available for people who have undergone involuntary sterilisation or unnecessary and irreversible medical or surgical treatment".